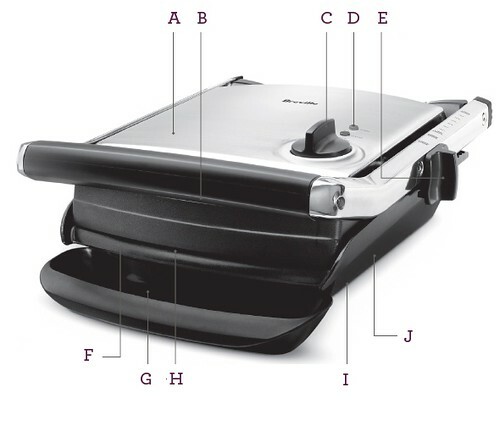 The Breville Panini Grill: Once you enjoy a café-style panini at home, sandwiches will never be the same. 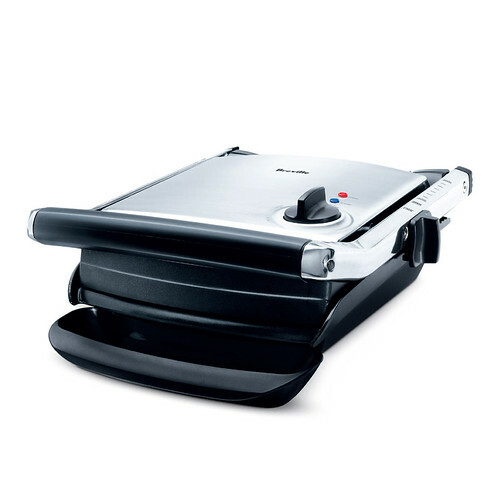 Adjustable height control ensures even heat for perfectly grilled sandwiches and more. The non-stick ribbed plates allow for cooking without added oils or butter for a more healthful cooking experience. A. Stainless Steel body. B. Floating hinged top plate. C. Variable Temperature control dial. D. Power 'On' and 'Ready' lights. E. Adjustable grilling height control. F. 1500 watt power source. G. Removable drip tray. H. Quantanium™ non-stick scratch-resistant cooking plates. I. Cord Storage. J. Extendable feet. Not Shown – Cleaning Spatula.